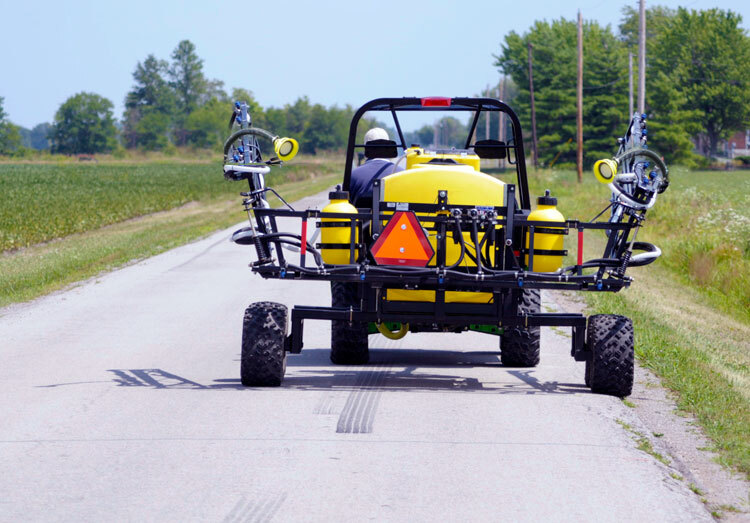 Go when and where big sprayers can’t with the Top Air ATV sprayer! 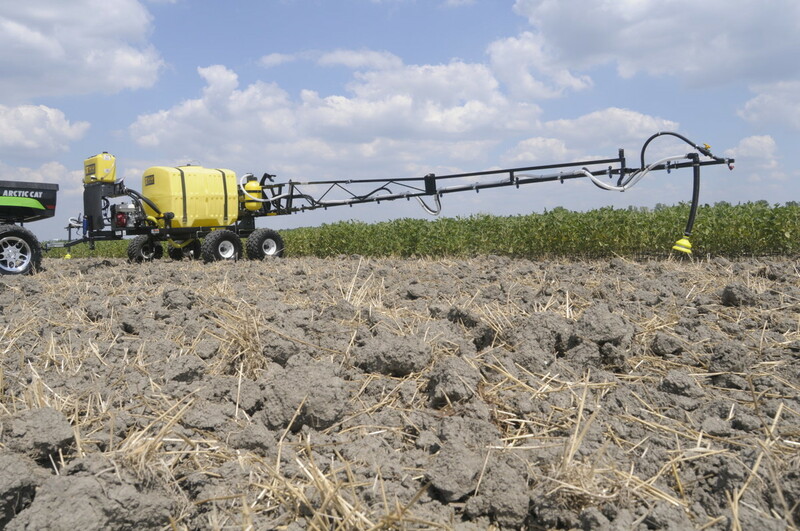 Featuring big sprayer performance, the ATV sprayer is a perfect compliment to a larger sprayer when field conditions are softer or require more precise spraying. 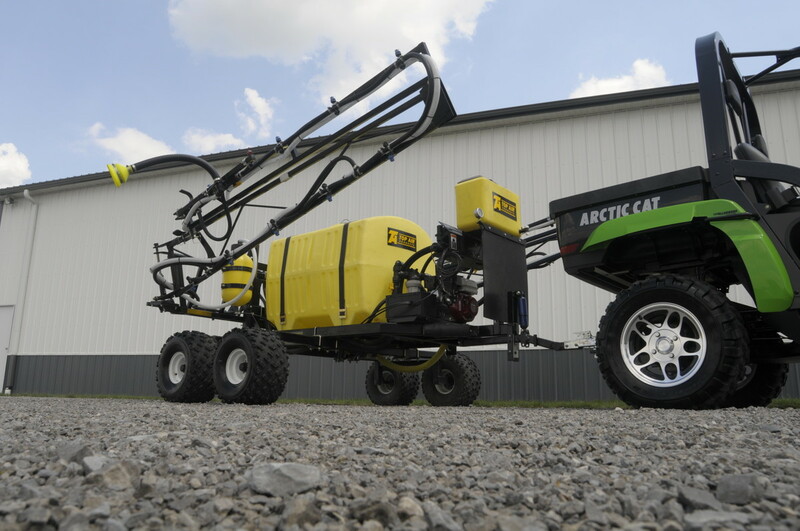 The Top Air ATV Sprayer features a 200-gallon tank with choice of 30’, 45’ or 60’ boom to meet individual needs. The heavy-duty frame and boom design can withstand the toughest field conditions, ensuring years of durable service. With its user-friendly features, versatility and heavy-duty design, you will quickly see how the Top Air ATV sprayer can quickly pay for itself. Self-leveling 30’, 45’ or 60’ manual front-fold boom widths available for meeting various grower preferences. Boom breakaway feature allows the boom to spring backward should it hit an obstruction and quickly return to operating position. Winch-controlled height adjustment on the boom from 12” to 30” locks securely into place. 3-section 30’/45’ boom and 3- or 6-section 60’ boom with electronic ball valves and singletip nozzles available on 15” or 20” spacing. Easy-to-see pressure gauge mounted at the front of the unit for handling a wide variety of spraying applications. 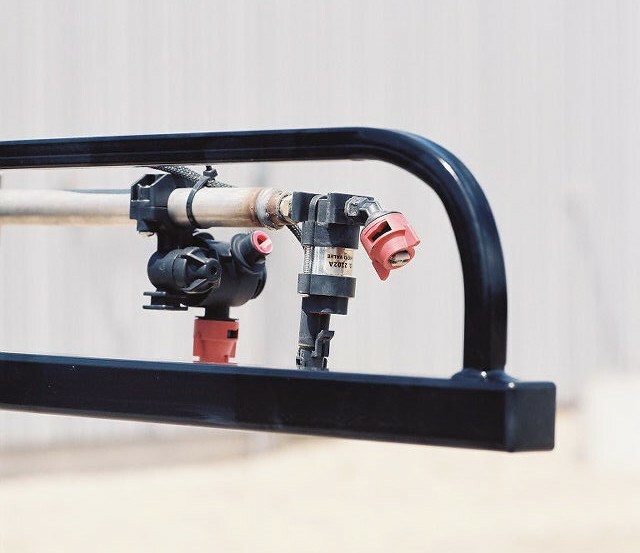 In-line boom strainer virtually eliminates nozzle plugging for uniform spraying. Raven 440 rate controller on 30’, 40’ and 60’ 3-section booms or Raven 450 rate controller on 6-section 60’ boom. Booms are finished with a baked-on, powder-coat finish for corrosion resistance. 200-gallon tank capacity requires a minimum 600 cc ATV for optimum performance. 2” quick fill is located on the rear of the unit for easy access and ensures fast loading. The tank volume indicator is located on the front of the unit for easy viewing. 9-gallon clean water tank with spout and eye wash tube is also equipped with a storage container. 5.5 HP Honda motor-driven centrifugal Ace 660 pump for easy and reliable operation. Tank agitation keeps the contents properly suspended for a uniform mixture of chemical.Undercarriage features tongue-mounted shock absorber for providing a smoother ride and uniform spraying over uneven terrain. Self-leveling tongue and 1 7/8” ball hitch for easy hookup and jack for easy storage. Tandem axles are infinitely adjustable from 60” to 90” to match row widths. 24x10.5x10 high-flotation tires can be moved fore and aft to ideally distribute weight. Standard transport lights for safer road travel. Undercarriage is finished with a baked-on, powder-coat finish for corrosion resistance. Hose reel with spray-gun kit comes with 25’ of hose and an on/off valve for ease of use. Foam marker system features two 3 ½ gallon tanks for precise marking on each pass. Fence row nozzle kit for precision spray placement along end rows. Tee-Jet 744A or Tee-Jet Manual Selector (30’/45’ booms only) controllers for meeting individual preferences.